The IBJJF Pro League’s Heavyweight GP is in the books. The all-star tourney sent eight of BJJ’s greatest to war against each other and paid out 40,000 dollars to the winner. Sitting absolute world champion Marcus Buchecha is that winner. 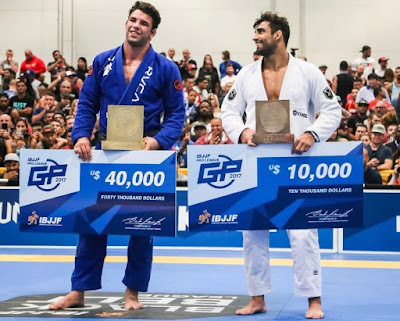 He faced his friend and rival Leandro Lo in a technical final reminiscent of the world championship’s absolute gold decider they did this year. To reach the GP’s final Buchecha first had to defeat Dimitrius Souza on advantages, and then finish João Gabriel Rocha via foot lock. Meanwhile, Lo was finishing Ricardo Evangelista via kimura and then edging out André Galvão by advantages. The final match saw Buchecha use pressure from the top while Lo was working to sweep. Both unable to score points, Buchecha and Lo ended up in a 1-1 draw on advantages. The judges felt that Buchecha had done better, and awarded him the title.